Our M-Series Ozone Generators truly are a quantum leap in Ozone Generation. Due to their specific elegant design and durability, all of our ozone generators reliably provide ultra pure, highly concentrated ozone for a wide variety of special applications. The Ozmotics M-Series ozone system exceeds the industry standard for customers demanding stable ozone output and reliability. The performance is unequalled in the industry, with the capability of reliably producing high concentration ozone 6 to 14% by weight, while efficiently producing up to 3.0 ppd (57 g/hr) of ozone. 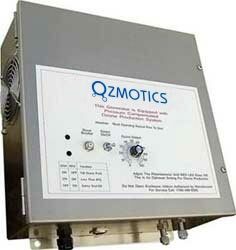 The Ozmotics M-Series flat plate ozone generator proprietary micro gap technology. The standard system design is dual rated for 50/60 Hz operation and requires one single point power connection. All prices are in USD and are subject to change without notice. Pricing below is the single-quantity suggested list price. Contact us for pricing on multiple unit orders. Power Requirement: 110 VAC 60 Hz Std. There are many more customizable Ozone Generators available - please contact us for details. Feel welcome to contact us with questions or comments.